I am back in Canada now. Having not had a chance to do any stamping, I will share another card from my classes earlier this year. This simple one layer card features that same layout I use over and over. I masked the top and bottom with post-it notes then sponged in pale green and pale blue leaving an area free of colour as a light focal point. 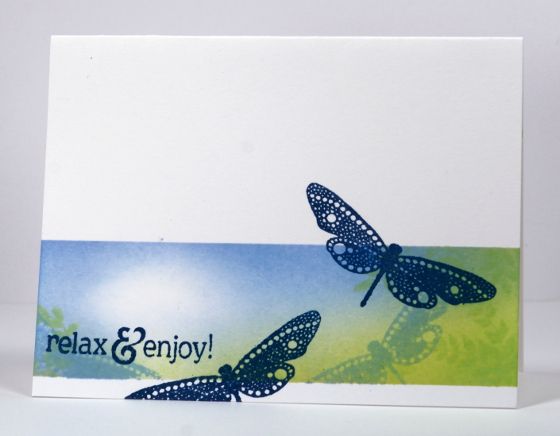 I added some foliage stamped in green and a couple of dragonflies stamped in blue. Finally I removed the masks and stamped dragonflies and sentiment in a darker blue. I may have some wintery designs for you soon, now that I have put away my sandals and shorts and pulled out boots and coat! Hi Heather, I am very happy to hear from you. Hope your Mom is good. And I hope the fire stop to burn in Australia. I am waiting for your wintery designs… as you know, you are my inspiration. You are my master! Welcome at home Heather! I don’t know, Heather… I quite liked seeing this summery card on a bleak November day. 😉 So pretty. Have missed your posts….welcome home Heather! This is such a lovely color combo – and as usual, well done! TFS wonderful inspiration!!!!! !